Fusarium wilt | Infonet Biovision Home. Chilli field infected with fusarium wilt ( Fusarium oxysporum f.sp. capsici ). Note gaps due to death of plants. Sweet-pepper root infected with fusarium wilt . Note brown discolouration of vascular tissues. 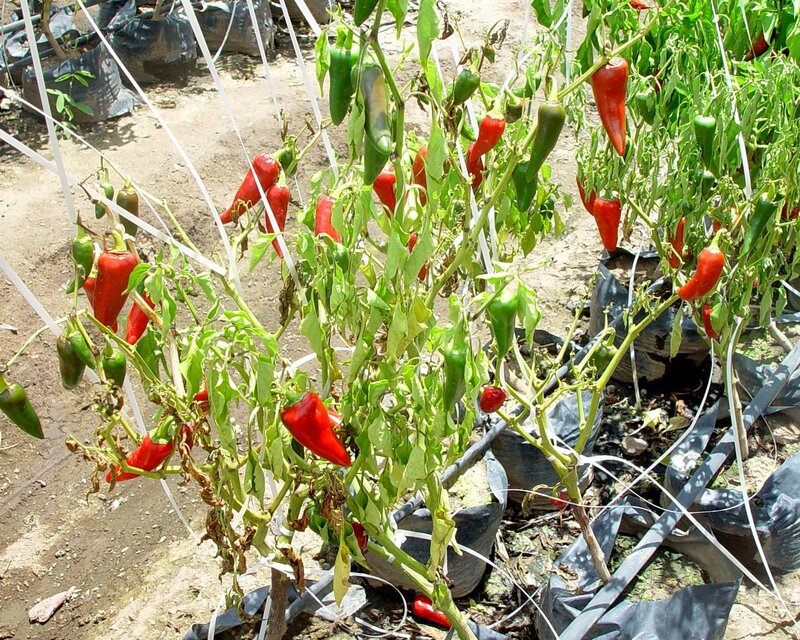 Chili plant infected with fusarium wilt (Fusarium oxysporum f.sp. capsici). 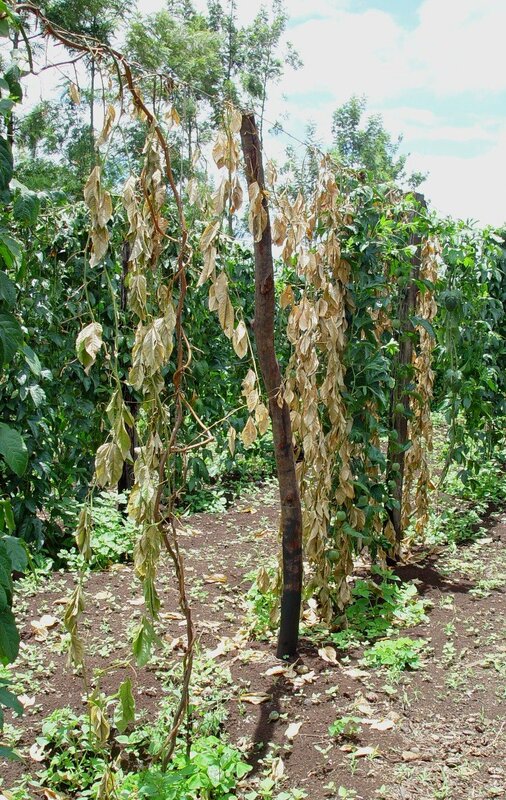 An infected plant is characterised by a strong yellowing of the leaves that remain erect for 1 to 2 weeks. Some of the leaves may then collapse at the leaf stalk and hang down at the pseudostem. The leaves fall in order, from the oldest to the youngest, until they hang about the plant like a skirt, and dry up. The fungus grows in the vascular system causing the plant to wilt. A lengthwise cut on the pseudostem will show numerous brown and black lines running in all directions. Infected suckers growing out of diseased corms (rhizomes) produce plants that wilt and eventually die. Leaf symptoms appear after the fungus has spread through the corm (rhizome). In younger plants, the first signs of infection are to be found on the unfurling leaf which turns yellow and dies off. The affected plants are stunted. The leaves turn yellow, wilt and are later shed. Usually the lower leaves are the first affected. When a stem or the main root is cut crosswise, brown discolouration is usually found in the ring just beneath the bark. 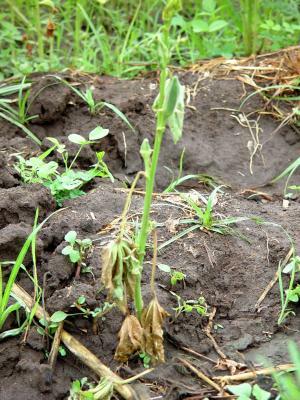 Wilting of plants is mostly gradual. The lower leaves of the plant usually turn yellow and die. One or more branches may show definite symptoms. Leaflets on one side of a petiole may be affected, while those on another side remain without symptoms. Diseased leaves readily break away from the stem. Sometimes the affected leaves may dry up before wilting is detected. 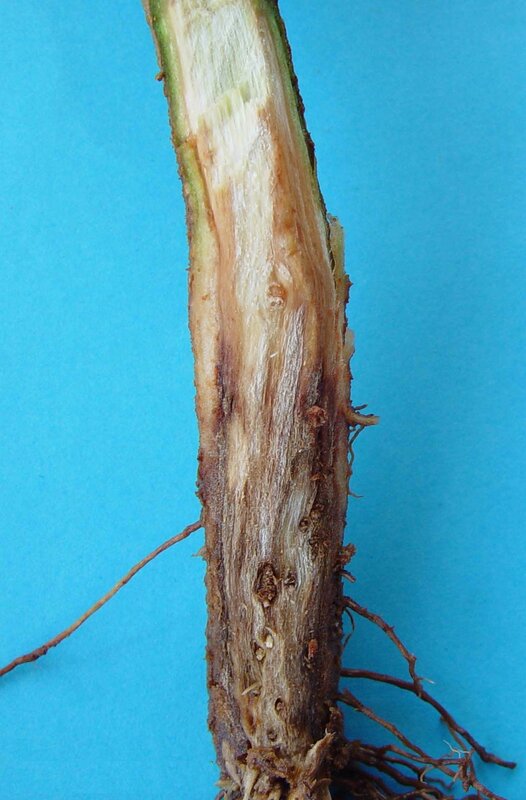 When affected stems just above the ground level and petioles are cut diagonally, a brown discolouration of the water conducting tissue inside the stem will be seen. 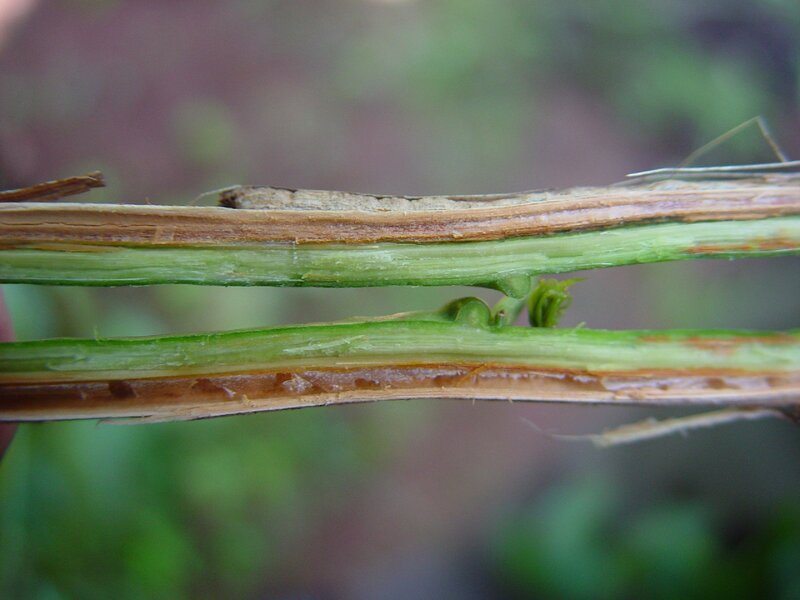 Infection often occurs on medium-aged or older plants. It begins as a yellowing and wilting of the lower leaves. The infection progresses up the plant until the entire plant turns yellow. Plants become stunted when infected at a younger age. To be sure that the plant is infected by Fusarium wilt, you make a lengthwise cut on the stem at the soil line, near the base. The cut has a dark-brownish vascular tissue below the bark. If an infected plant is uprooted, the roots are partially or totally reddish-brown in colour. Cotton and Okra: Seedling stage and vegetative growing stage. 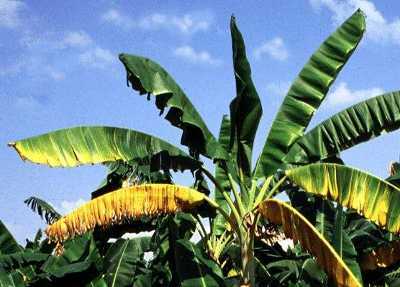 Banana: Flowering stage, fruiting stage and vegetative growing stage. Tomato: Flowering stage, fruiting stage and seedling stage. Banana: Growing points, leaves, roots and stems. Tomato: Leaves, stems, whole plant, and roots. Cotton and Okra: Leaves: yellowing lesions; abnormal colours. Whole plant: dwarfing. Banana: Growing points: dead heart. Leaves: lesions; yellowing; wilting; Roots: rot. Stems: internal discolouration; stem splitting. Tomato: Leaves yellowing. Stems: internal discolouration. Whole plant: wilt. The fungus is both seed-borne and soil-borne. 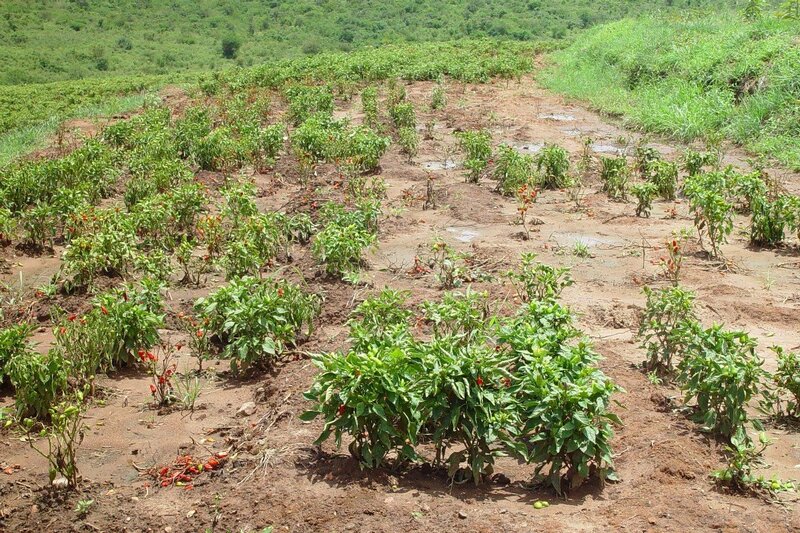 It may become established in many types of soil, but it is likely to cause most damage on light, sandy soils. It is most active at temperatures between 25 and 32deg C. Since the fungus produces resting spores (chlamydospores), it can survive in the soil indefinitely even when no host plants are grown. It can also survive in fibrous roots of weeds such as Amaranthus, Digitaria and Malva. It can spread by movement of infested soil or infected transplants. Acidic soils (pH 5.0 to 5.6) and ammonium nitrogen (ammonium nitrate and urea) promote disease development. Infestation by root-knot nematodes enhances the disease. 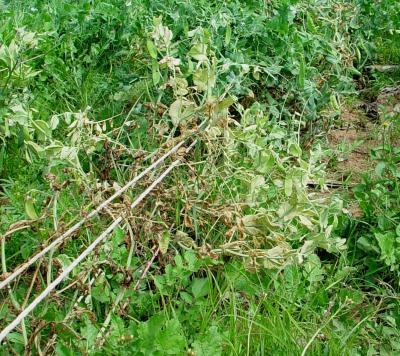 Further below you find concrete preventive and curative methods against Fusarium wilt. Because Fusarium persist several years in soil, a long crop rotation (4 to 6 years) is necessary. 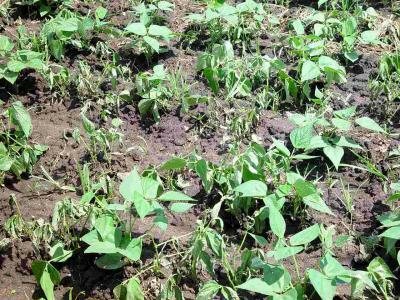 Avoid using any solanaceous crop (potato, tomato, pepper, eggplant) or other host plants in the rotation. Rotate with cereals and grasses wherever possible. Avoid fields with a long history of Fusarium wilt. Use resistant varieties, e.g. tomatoes: 'Diego', 'Duke', 'Floridade', 'Fanny', 'Fortune Maker', 'Napoli', 'Radja', 'Roma VF', 'Roma VFN' and 'Tengeru 97'. Graft tomato plants on resistant root stocks where available. Raise soil pH by applying lime or farmyard manure where soil is acidic. Do not use chicken manure, which is very acidic.